After realising a while a ago that starting the day with bread wasn’t making me feel as good and energised as I needed in the morning… I was lucky enough to be given a Nutribullet – an extractor which unlike everyday juicers and blenders completely breaks down ingredients in to their most nutritious, most absorptive state! I haven’t looked back! Here is my favourite Green Smoothie recipe, which uses Spirulina – a fabulous source of plant-based protein, amino acids and many other nutrients. 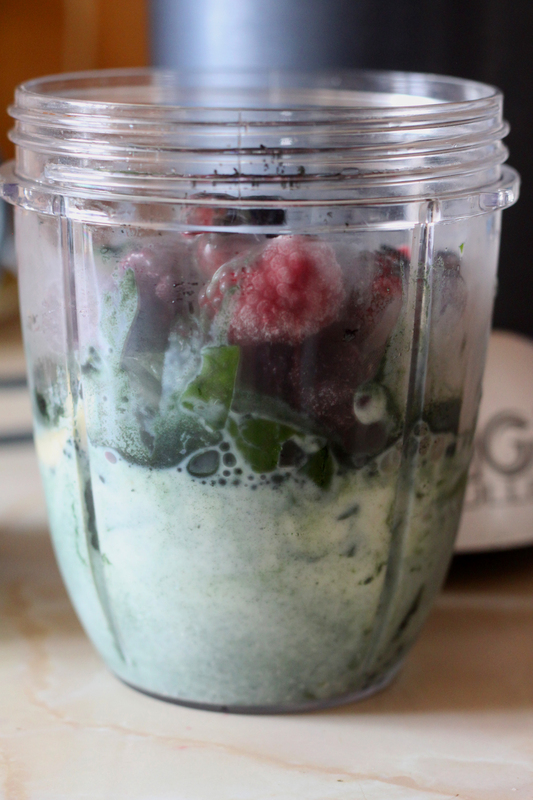 Frozen spinach and berries blended together with banana give this chilled drink a smooth and thick texture. You can feel how much your body will benefit from it as soon as you take a sip. Toddlers even like it too! 1. Place all the ingredients together into your Nurtibullet or other strong blender and liquidise. Remove the lid and add more milk into the smoothie if it is too thick. Enjoy and feel rejuvenated!